Laundry Hacks: Make Laundry Easier with these Tricks! Laundry is the never-ending chore. It goes away for 2 seconds and then it’s right back. Having 5 kids means my life is a never ending laundry story. You might want to avoid it, but it is always waiting for you. 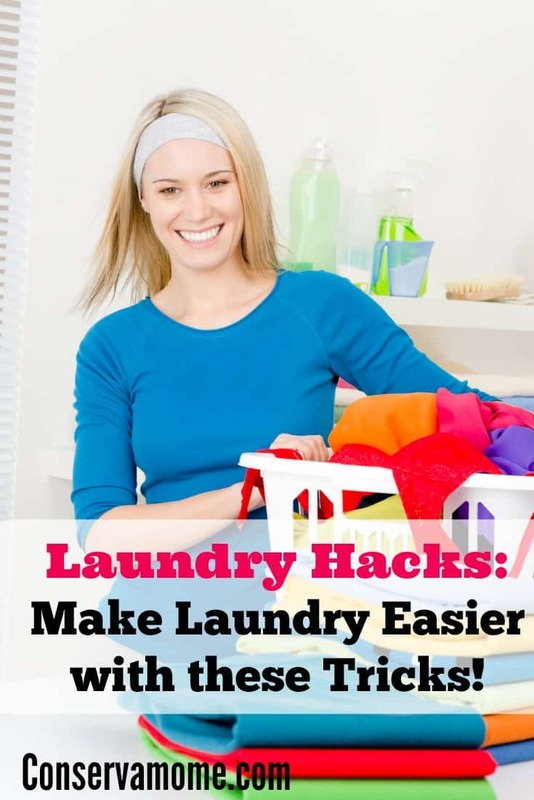 I wanted to share some great laundry hacks that every mom will want to know! With busy schedules, we all can use a little help to make life a bit easier! So keep reading to read some pretty awesome laundry hacks! Dry Clothes Faster: Put a couple of tennis balls in the dryer, it speeds up the drying time, and leaves clothes nice and fluffy! Mesh Bags: These are great to use, they work great for socks and undergarments! Never lose a sock again! Wash and dry in the mesh bags, so you don’t lose your garments! Clean Washing Machine: If your washer is smelling a little off, try cleaning it. Add two cups white vinegar, and fill basin with warm water. Let it sit for around an hour, and then run the cycle as usual! I do this once a month. Multi-Bin Hamper: You can buy hampers that have 2-3 spots to place clothes. This is great to place darks in one, whites, towels, etc. Then you just grab it directly out of the hamper and toss in. No more sorting to find all the whites! Makeup Stains: If you have a little foundation or makeup smudge on a shirt, try using shaving cream. Use it to pre-treat the stain, I have heard it works wonderfully. Just put a little on the stain, let sit 5 minutes then wash.
Oil Stains: Put baby powder on oil stains and let it soak it up overnight. Then just wash like regular. Ice Cubes to Dewrinkle: If you want to dewrinkle something, add a couple of ice cubes in the dryer. Run the dryer for about 15 minutes. As the dryer heats up it melts the ice, and steams the clothes. Aluminum Foil for Dryer Sheets: Instead of dryer sheets, take some aluminum foil and roll into a tight ball. Use these instead of dryer sheets. Works great at softening your clothes. What are some hacks that you use for your laundry? I’m constantly looking for ways to make laundry easier and I can definitely do that with these hacks! Since I have two girls right now, I wash all of their clothes together. This keeps kids and adults clothes separate. But as we get more kids (we are having a boy soon), I probably will also just put each of kids clothes into a mesh bag and wash it separately. For right now I do that with socks so that I don’t have to hunt for them (and small socks are more likely to get lost in an HE washer, as are cloth wipes!). I was really looking forward to having less laundry to do now that our cloth dipes are taking a break until little brother arrives, but no.. It’s the same amount of work somehow. I have never heard of the ice cubes before -neat idea and the foil, that is one I have never heard of either! Some of these are really clever…is there a hack to folding a massive clean laundry mountain?… Asking for a friend. These are some awesome tips! I never knew about the aluminum foil or the ice cubes! Genius! I use baking soda for everything but I put about a cup of it in the washer with my husband’s clothes to get the oil and “man smells” out. The only one I didn’t know was the aluminum foil, now that sounds really interesting. I’d also suggest wiping down the door of the washer and the seal to remove any left over water – this helps enormously to cut down on smells. So far I’ve used my washer for 4 years and have never had a bad smell yet. I never knew the Aluminum Foil for Dryer Sheets and ice cubes in the dryer does the trick. ??? Awesome !! I’ll have to try the ice cube tip! I hate having to iron my hubby’s work clothes! Lol I make wool dryer balls to use in our laundry… I have to make them rather often though because my 3 year old will sneak them out of the clothes if she can! AH! These are wonderful tips. I have to try the shaving cream one and the steaming with the ice cubds is genius. great tips, i just try to find some way to enjoy it, its gonna happen with 11 people, 9 of them kids. I have some wool dryer balls that I use. They do seem to make things dry faster. If your machine is equiped, it is always good to clean out the fabric softener dispenser. It is a horrible mess. I haven’t tried the last two yet, I will. I never remember to put an paron on while cooking an dmy clothing shows it. These are such helpful hints and most of them are new to me. I would never have thought of a tennis ball or using a mesh bag. Super ideas. These are great tips! I used to always use the mesh bag trick when my grandson was younger….no missing socks! Great ideas! I’m going to add cleaning my washing machine to my monthly cleaning list! Never thought to do that. I am going to try these. I never thought of using aluminum foil in the dryer. Oooh Tennis balls and foil?!?! Very interesting!! I have never heard of them before! !